Since 9/11, there has been a spate of independent films in which outsiders find themselves lost and adrift in New York City. 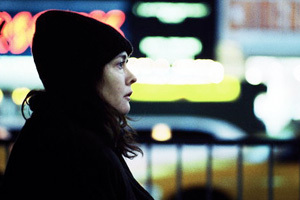 While these films share a general sensibility, they each bring something different to their portraits of disturbed characters under duress: the harrowing hyper-drama of Lodge Kerrigan’s Keane, the European tension of Julia Loktev’s Day Night Day Night, the sparse loneliness of Preston Miller’s Jones, and, in a more roundabout way, the gritty realism of Debra Granik’s Down to the Bone. Add Kyle Henry’s Room to that list. While Room screened at Sundance and Cannes in 2005 and received a minor theatrical release followed by a John Cassavetes Award nomination at the 2006 Spirit Awards, it somehow slipped past me back then. Which is unfortunate, for having watched it recently, a few years later, it strikes me as being more than just an accomplished low-budget thriller in the vein of these other works. It is, in fact, one of the more effective true indies to depict the struggles of a working-class American trying to survive in a politically and economically disturbed early 21st Century America. In our current economic climate, in which it appears that things are going to get much worse before they begin to get better, Room feels prescient and timely. Cyndi Williams gives a naked and startlingly natural performance as Julia Barker, a Houston mother of two who works at a local bingo hall to barely pay the rent. The early scenes of Williams at work and at home recall Courtney Hunt’s soon-to-be-released Frozen River, but in Room, Henry doesn’t resort to stereotypes to make us feel this mother’s exhaustion. Instead, after an opening credit sequence that sets a haunting tone, he shows us her daily routine in brisk, but precise, detail, with its constant barrage of stressful, demeaning, and stifling situations (she can’t even take a nap without being bombarded by news about Iraq). With his background in experimental cinema, Henry uses atmospheric sound design and abstract visual cues to establish Julia just how strained Julia is becoming, and he also incorporates audio news reports to reaffirm that the problem is not simply within. When she begins to see visions of a desolate white room, we connect with her subconscious desire to check out of life and escape to a place that is empty and quiet. Julia’s relocation to New York City is an unexpected one, but Henry’s sense of place is so assured, and PJ Raval’s cinematography so immediate, that the script’s riskier (i.e., more implausible) plot devices don’t become a distraction. As Julia wanders from Queens to Manhattan to Dumbo to midtown, she confronts just a few of the infinite eccentrics that New York City has to offer. And while some of these peripheral encounters feel more convincing than others, Williams is always there to keep us grounded. This is one of those performances that makes or breaks a film. Williams, who doesn’t feel like an actress at all, makes it into something that it otherwise might not have been. Eventually, Julia finds her room. Or does she? Henry’s unsettling, ambiguous climax seems to say that there is no room; there is no place to hide from the crushing realities of our everyday lives. Our world is in turmoil, and fleeing home or shutting down completely won’t do anything to change that cruel fact. That we are not actually in control of our own destinies is a terrifying realization, but it is one that most of us have to confront at some point in our lives. Especially now. Room is an ambitious, intelligent low-budget thriller that deserves to be revisited at this fragile moment in time.